Most Management Consultants are actively pursuing “random selling”… meaning everything they’re “supposed” to do to feel like they are doing the best they can like: networking (not predictable or leveraged), referrals (not systematic or scalable), social media (not targeted lead generation), online content publication (the illusion of authority) and ultimately often leads to ‘chasing’. The reason for this is because, many do not have an Engineered Sales Process that builds trust and opens a two-way dialogue that allows them to create a human connection that will draw out the ideal client. In addition to that, the trend has been to ‘move the free line’ and give away more and more valuable IP in the ‘hope’ of gaining new clients – free consulting. Our global clients come to us looking for a sales process that cuts through the complexity of the thousands of options available to engage a new potential client. They are looking for an elegant and sophisticated system that feels utterly simple, eliminates all sales pressure – and makes the new client engagement process resistance-free – by being positioned as The Trusted Authority. 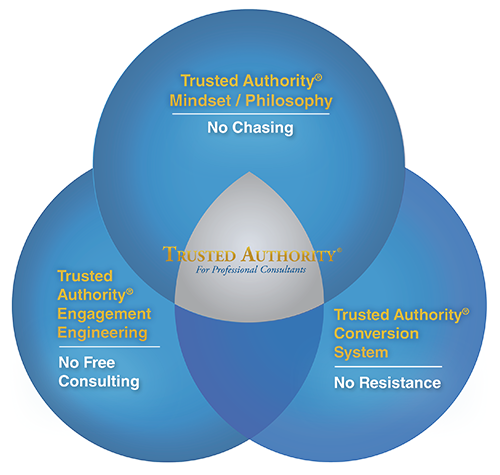 If you’re still chasing new client projects, you’re not a Trusted Authority®. Copyright © 2019, Unlock The Game Pty Ltd ABN 39-001-118949.